Hilarious Youtube Vid - Gay Zombies! Simply put, this is hilarious, enjoy. New Game!! Zombie City 2!!! Our third zombie game, this time its Hockey themed. Shoot the zombie head into the hockey goal to score! Three different modes of gameplay. Including three periods timed, free play and training. Enjoy! Check out our second game! Your a zombie pushing a cart, trying to pick up body parts and reach the finish first! Simple right? Can you beat all 3 levels? This is our second game for flashzombies.com. Enjoy! MARV #50 We Have 50 Marvs!!! MARV #49 Happy New Year! MARV #48 Its Xmas Month! MARV #47 A New Marv! MARV #45& #46 Hello Marv! MARV #43& #44 New Marvs! MARV #41& #42 FINAL WEEK! MARV #39& #40 THIRD WEEK! MARV #37& #38 SECOND WEEK! MARV #35 & #36 FIRST WEEK! MARV MONTH @ THE FORUM AND NEW COMICS!! MARV THE ZOMBIE COMIC!! #23, & #24 ARE HERE! GUEST MARV COMIC!! #20!! ALL ABOUT THINGY! NEW MARV COMICS!!!!! #17, #18 and #19 Finished! NEW MARV COMICS!!!!! #14, #15 and #16 Finished! NEW MARV COMICS!!!!! #12 and #13 Finished! VOTE FOR FLASHZOMBIES!!! you like us vote for us! Marv the Zombie - Comic Strip #11! 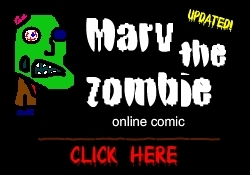 Marv the Zombie - New Flashzombies Online Comic! Hello Zombie 2 - FINALLY FINISHED! New Zombie Sprite Cartoon- "The Dead"
2 New Resident Evil 4 Wallpapers & Zombie Game!! 2 Resident Evil 4 wallpapers added to the goodies section for your desktop! Also the Zombie Infection Simulator Created by Kevan Davis, is available in the goodies section. Be sure to check that out. You must have Java installed on your computer to play the game. Goodies section now available with many wallpapers, AIM icons and an interviews. Three new reviews on, Resident Evil (ps1), Dawn of the Dead 1978, Dawn of the Dead 2004 and House 1985. Be sure to check them out. Thanks for checking out the new FLASHZOMBIES.COM!! Please mind our mess, we are currently under construction. Lots of changes and added features to this site. FlashZOMBIES.com will be updated weekly, so make sure you come back for the latest cartoons, reviews, goodies and links to the coolest Zombie stuff on the net! Also you can view the movies we have so far. Zombie Sprites, and Hello Zombie. Sequels to both cartoons are in the making and will be completed in the new year. Be sure to keep checking back for the latest news and reviews about the undead.